Ask fellow campers about "Welcome Station RV Park" and nearby attractions. This RV park is terrific. First, the owners go out of their way to be friendly. There is always a smile on there faces, never a frown. They have plenty of suggestions on things to do while in the area. Back in sites are large and grass covered. Pull-throughs are about average size for pull-throughs. Yes, there is some dirt on the sites, but it's under your camper and isn't really an issue. Our Verizon MiFi and AT&T cell phones worked just fine, even without an amplifier. Dish TV also worked well for us. Other sites may not have the same results because of the trees. We liked this park and the people so much that we will be back next year and this time we'll stay for several days. 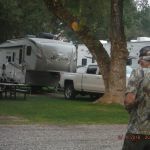 We camped at Welcome Station RV Park in a Fifth Wheel. At one time this campground was part of a larger facility that was on old I-80, 8 miles west of Wells, NV. Today the cabins, restaurant and fuel station are gone but the campground and facilities remain, in good condition and easy access from the I-80 freeway. The woman that we first encountered was hostile. The guide in the golf cart intervened and lead us to our pull-thru site then stayed and chatted during set-up. There was a large gathering at the lower end of the CG, several RVs and tents but not noisy. There wasn't much road noise. We would return to this CG if in the area in the future. 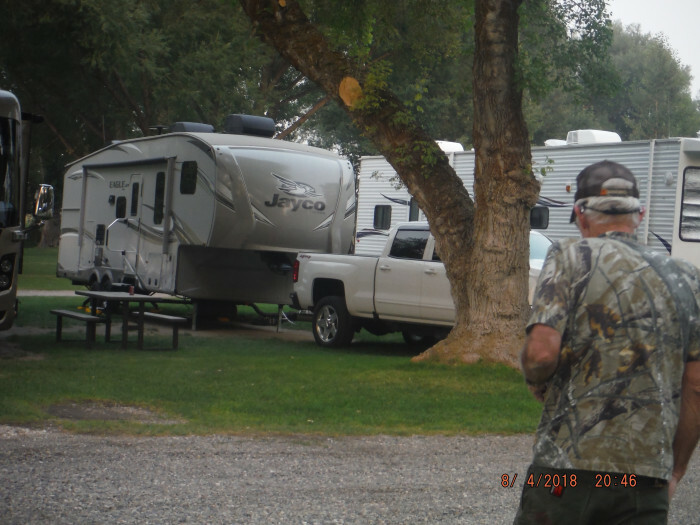 We camped at Welcome Station RV Park in a Fifth Wheel. Closest fuel is Wells at the interchange. Avoid the Chevron. They post a lower price on the signs, but their gasoline pumps are all bagged off, no gas. The diesel number on the big sign was 21 cents less than the pump price and its a gimmick. Their pump credit card readers don't work. This park had a 8.1 rating but we would not rate it that high. Owners wanted us to pay in cash and then we had to wait to get a receipt. When you arrive you have to call them to have someone come over and show you to your site. Sites are dirt which made a mess when the wind started to blow. No WiFi. No TV (not even OTA). There was grass in between some of the sites, but with few amenities we don't think this park warrants a 8.1 rating - more like a 7.3. We camped at Welcome Station RV Park in a Motorhome. We are so sorry you feel your stay at Welcome Station wasn’t a pleasant one. We pride ourselves on giving the best service we can. 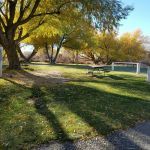 We greet people at the entrance of our 5 acre, green oasis of grass, big trees and running stream RV park, so that they feel welcome and help them get into their site. As a “Mom and Pop” privately-owned park, we strive to do our best. We have even taken your advice and put our receipts on our clipboard so we can hand them to you right away. We do thank you for your feedback and certainly hope you come to see us again. Great owners that could not be nicer. Utilities are in the proper spot and worked great. Nice park like area on the grounds with benches at various locations. I could go back to this park in a heart beat. I camped here in a 40' motorcoach. We camped at Welcome Station RV Park in a Fifth Wheel. This was a one night and move on stay. It was pleasant and the owners are very nice. Big pull throughs on grass can handle the big pushers towing a vehicle so they handled our 28 foot fifth wheel easy enough. Sure there is highway noise made worse by the fact the highway in that area may be one of the worst condition stretches in all of Nevada. All that said, we would stay again anytime. We camped at Welcome Station RV Park in a Fifth Wheel. Well we did not stay but we had tire problems and got great prices and service at the Pruitt tire company in Wells. Very clean and nice. Lots of old trees and grass. 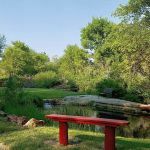 Peaceful areas for sitting and enjoying the creek and pond. I-80 a little noisy when outside, didn't really pay attention to it in the 5th wheel. Spaces are 20' across. No internet or tv. Owners very nice and work very hard to have such a nice place. We camped at Welcome Station RV Park in a Fifth Wheel. Elko is 40 miles west, Wells is 10 miles East. The park's setting is pleasant but the sites are very, very narrow and have absolutely no privacy. The road is gravel and the sites are dirt with a little grass. The trees are nice but block rooftop satellite access. Verizon and AT&T work well if you have an amplifier. The pull-throughs aren't angled at all and getting a 40' MH with a toad in and out without unhooking is challenging. The owners are very nice. We camped at Welcome Station RV Park in a Motorhome. Full disclosure: The owners of this park are friends of ours. They bought the park just last year, and we wanted to visit. They had stayed at the park previous to purchasing it and told us what a beautiful green oasis in the desert it was... but until you see it, you just can't believe it! 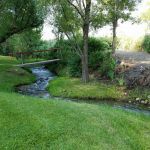 There are creeks running on both sides of the property, and beautiful green grass and huge shade trees all around. The owners host a campfire on many nights (unless the weather is too windy) - a great time to get together with fellow campers. The rate we paid reflects the weekly rate which is super reasonable. We thoroughly enjoyed our time at Welcome Station RV Park. We camped at Welcome Station RV Park in a Motorhome. Wells has a small grocery store; best to stock up before coming or the drive to Elko is pretty but 40 miles away. Very pleasant experience! Very friendly owners. You can see the improvements being made. 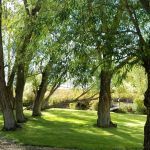 The clear running creeks and the beautiful old willow trees are very enjoyable! The grass is very green and well maintained. The scenery there would make a perfect setting for an outdoor wedding. They were having entertainment tonight. You will enjoy your visit very much to this park! We camped at Welcome Station RV Park in a Motorhome. Wells, NV is 8 miles away. The town has a museum in the visitors center. Elko is 42 miles west. A nice size town that has a nice museum and lots to do there. There are a lot of scenic trips around Wells. I may had one of the best sites in this small and tidy park. # 3 because it was one of only a few that allowed satellite reception and also was 90 ft long for our long MH and car trailer with adequate swing room in and out . A relaxed check-in and guided to our site. Manicured grass sites that were somewhat close together but we needed the length of the site that no other park in the area offered. 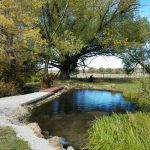 We did walk around the spacious grounds, which is encouraged, and the small flowing natural creek and small waterfalls through the property with the towering old trees was very peaceful. There is a circle of chairs set up and afternoons and evenings everyone is encouraged to meet and visit. We enjoyed this park immensely and we would return. We camped at Welcome Station RV Park in a Motorhome. Much more green and lush than most campgrounds we've been to. Very friendly on site owners that are helpful and passionate about providing a good experience. We camped at Welcome Station RV Park in a Motorhome. Lovely, small park with huge shade trees and lush grass. Very easy access to I-80. Site 8 has a beautiful view of a horse pasture and mountains in the distance. Beautiful stream and irises at this time of year. We did not have to unhook our 39' 5th wheel. Very friendly/ helpful owners. There is highway noise, yet we would definitely stay here again. 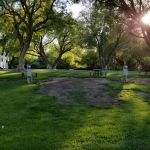 We camped at Welcome Station RV Park in a Fifth Wheel. We got diesel in Wells where there are multiple stations. Nice little RV Park very close in the Interstate with some road noise. Super great owner and park is spotless with lots of room to walk the dogs on GRASS, no stickers! No WiFi, utilities worked great. Will stay again if in the area. We camped at Welcome Station RV Park in a Motorhome. Small park with beautiful landscaping. Owner waters the grass and you can tell he takes pride in the park. Sites are a little close together but I can live with that. Has a small pond with seats and a creek with ice cold rushing water. Very nice. We camped at Welcome Station RV Park in a Motorhome. Load up on Groceries in some other town as there is nothing out here. Are you affiliated with Welcome Station RV Park ?